What did the Emancipation Proclamation exactly do? I'm a bit confused about what Lincoln's proclamation did exactly. It's thought by some the Emancipation Proclamation gave all slaves the status of free. However from reading the introduction of the Wikipedia article this belief seems wrong. The Proclamation did not compensate the owners, did not outlaw slavery, and did not grant citizenship to the ex-slaves. (bolding is mine). I know the Thirteenth Amendment did unequivocally outlaw slavery, but I would like to clarify some things about the Emancipation Proclamation. It changed the federal legal status of more than 3.5 million enslaved African Americans in the designated areas of the South from slave to free. As soon as a slave escaped the control of the Confederate government, by running away or through advances of federal troops, the former slave became free. So if a slave in a slave state could escape a Confederate slave state into territory controlled by the Union army, they were made free. This I understand. It did not apply to states which practised slavery but were not in rebellion, such as Kentucky, Maryland and Delaware. This I understand. The Proclamation ordered the freedom of all slaves in ten states. Because it was issued under the president's authority to suppress rebellion (war powers), it necessarily excluded areas not in rebellion, but still applied to more than 3.5 million of the 4 million slaves. The proclamation changed the status of slaves in the Confederate states in rebellion against the Union. What I don't understand is say for example you were a slave in a rebelling state not controlled by the Union army, were you made free by this proclamation? Say you had not managed to escape your master and leave the state, did this proclamation legally give you the status of free, even though your master forced you to continue to be a slave? Also there seems to be a contradiction, or at least a redundancy, because first it says if a slave was able to escape Confederate controlled territory past the advances of the Union army they were made free. Then it says that the proclamation instantly gave the legal status of free to a slave in a rebelling Confederate state. Since it only applied to areas that didn't recognize Federal authority, the snarky take on the Emancipation Proclamation has always been that it didn't itself free a single slave. Like a lot of famous snark, this isn't entirely true. The US Army had already been given the authority to free any slaves it came across in Confederate territory as Contraband of War for the previous two years. However, "Contraband" rule was at military discretion, which left a lot of slaves behind Union lines in limbo until a decision was made on their specific case. The EP made it automatic. Something on the order of 20-50 thousand slaves were freed the day it took effect. There were about 300,000 slaves in the exempted (blue) areas, and 100,000 in the red areas that were legally free on Jan 1, 1863. It was no longer politically feasible for the government of England to recognize, or even really support, the Confederacy. There was no longer a good hope of a negotiated settlement between the two sides, as their goals were now diametrically opposed. Union troops now officially had a moral cause they were fighting for that justified their sacrifices. "We don't want them to leave" was always weaksauce. What I think might not have been obvious to a lot of people at the time was that, whatever else may have happened, as soon as the Proclamation was issued, slavery was as good as dead in the United States of America. No matter what the existing legalities may have been, when 400,000 young men died fighting it and another 300,000 were casualties, it was simply politically impossible for the cause of that to be tolerated any more. 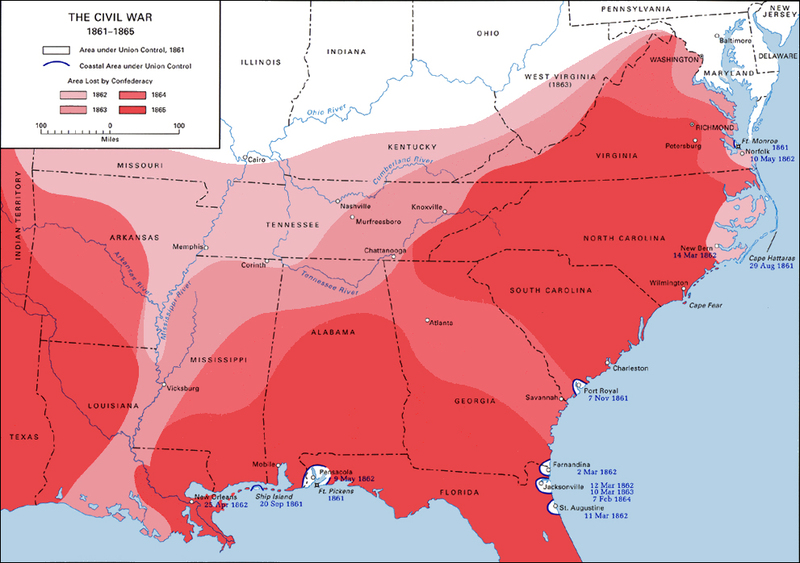 It's biggest effect was diplomatic, in that it turned the war from a political one to a moral one, thus removing any chance of official support for the Confederacy from Britain and France. If the question is what did the Emancipation Proclamation accomplish immediately then the above answers address it well. If the question is what did the Emancipation Proclamation accomplish, then the answer is it freed the vast majority of slaves in the United States. The Thirteenth Amendment while technically freeing fewer slaves was important because it gave permanence to that freedom. Parts of Southern Louisiana and Alabama. However, by the time the superceeding 13th Amendment was ratified January 31, 1865. The Emancipation Proclamation covered most of the South except for the city of Richmond and parts of North Carolina . The only two Confederate Armies still in the field were Lee's Army of Northern Virginia blockaded in the city of Richmond, and Johnston's forces in North Carolina. Only Lee's Army at Petersburg and Johnston's forces in North Carolina remain to fight for the South against Northern forces now numbering 280,000 men. Lincoln needed to pass the Thirteenth Amendment primarily because he invented his authority to free the slaves in the Emancipation Proclamation. In war time he granted himself a power which not even Congress had in peacetime. Lincoln invented the war powers which allowed him to selectively suspend the constitution, overrule the courts, and Free the Slaves with a Presidential order. Abraham Lincoln's invention of Presidential War Powers Abraham Lincoln's Invention of Presidential War Powers: Facing the unprecedented crisis of civil war in 1861, President Abraham Lincoln invoked his "war power" as commander-in-chief to "take any measure which may best subdue the enemy." Defying the chief justice of the United States, he suspended the writ of habeas corpus by presidential decree. He also declared martial law, authorized the trial of civilians by military courts, and proclaimed the emancipation of slaves--all on the grounds that "I may in an emergency do things on military grounds which cannot be done constitutionally by Congress." In so doing, Lincoln vastly expanded presidential war powers and established precedents invoked by later presidents. I think you are getting hung up on the fact that Lincoln's Presidential order only freed the slaves in the sucessionist South. This was a political move, and shouldn't be interpreted that Lincoln favored slavery in any part of the union. The entire Republican Party was founded to abolish Slavery. All of Lincoln's cabinet (most of whom were Presidential candidates who ran against Lincoln for the nomination in 1860) opposed slavery. Yet when Lincoln first proposed the Emancipation Proclamation his cabinet initially talked him out of the action along political grounds, until the Union had a victory on the battlefield. After the Union's victory at the Battle of Antietam, Lincoln's cabinet again opposed the Proclamation and Lincoln overruled them. These were committed anti slavery politicians who all got timid when it came time to outlaw slavery. There were real political concerns for a President entering into a re-election cycle. Lincoln's exception of the border states allowed him to frame the proclamation as a punitive act against the South. This was important because a significant part of the country at the time were lower paid day laborers who saw freed slaves as economic competition for jobs. The compromise, omitting the border states, allowed Lincoln to pass a law targeting most of the slaves without alienating a significant voting block before he stood for re-election in 1864. It was argued then and continues to be argued that the Emancipation Proclamation did not free more than a handful of slaves and was therefore irrelevant. The Declaration of Independence did not make the US a “free and independent nation.” That took seven more years to accomplish. And, had the British prevailed, the Declaration would be of interest only to students of failed revolutions. On the contrary, during the American Civil War, all of the slaves in the areas delineated were free de facto with thirty months of the Emancipation Proclamation and a large number were freed immediately. The Emancipation Proclamation was prospective, i.e., it would free slaves as the United States Army marched south, and the Yankees were on the advance. The Emancipation Proclamation also freed slaves in areas considered to be in rebellion, many of which were controlled by the United States on January 1, 1863. Reading the Emancipation Proclamation, and comparing the areas included and excluded, shows that the immediate effect of the Emancipation Proclamation was to free a large number of slaves, in areas under United States’ control, but still considered to be in rebellion. The Emancipation Proclamation preserved slavery only those areas not in rebellion, not those areas under United States’ control on January 1, 1863. And that is a huge difference. Note that in Louisiana the excluded areas are New Orleans, the Mississippi Delta and the area immediately west of the Delta (county lines were a little different in 1863 than now, but close enough to use Rand-McNally). However, the US Army had occupied more of the state to the North, heading, as they were, towards Port Hudson. So all of those slaves were freed. The excluded areas of Virginia included West Virginia (small slave population anyway), and Berkeley County, which is the start of the strip of West Virginia which today takes in both Berkeley and Jefferson (Harpers Ferry) counties. But Jefferson County was not excluded. (Trivia point: obviously the boundaries of the new state of West Virginia were still in a bit of a state of flux. I believe [which means I do not know enough West Virginia history to say one way or another] the inclusion of the lower Shenandoah Valley into West Virginia was a political stroke to make certain that if there was a peace treaty between the US and the CS, the B&O Railroad would all be in the United States). The only other parts of Virginia excluded were the Eastern Shore (the peninsula that stretches South from Eastern Maryland towards Cape Charles), and the area around Norfolk-Hampton-Fortress Monroe. However, the United States controlled all of Virginia north of the Rappahannock, including, obviously, Alexandria County, which then consisted of Arlington and Alexandria. They also had a presence in the Shenandoah. Now “control” is a relative word: John Mosby would have disputed the above paragraph! But, nevertheless, the Confederacy did not control most of Northern Virginia. So there are two big areas, and, in the case of Virginia, important areas, where the slaves were freed on January 1, 1863. In addition, the Emancipation Proclamation freed slaves in Arkansas, Georgia and the Carolinas. On Emancipation Day, the United States controlled much of tidewater and the barrier islands of Georgia and North and South Carolina. The Union controlled the Ozarks of Arkansas (not many slaves) but also the heavily slave areas of the extreme northeastern counties of Arkansas. The blue coats were in possession of major portions of North Mississippi and Alabama, and they would, within a few months, liberate the densely slave occupied areas of the Mississippi black belt between the Mississippi and the Yazoo. Quite a large number – probably hundreds of thousands, maybe even a million or more, of the slaves were freed – and freed immediately – by the Emancipation Proclamation. And the balance of the four million would be de facto free within thirty months. At the time Emancipation Proclamation was signed, United States could not enforce it immediately, because legally emancipated slaves resided on territories, controlled by Confederacy, and their masters did not obey US laws. Not the answer you're looking for? Browse other questions tagged united-states slavery american-civil-war or ask your own question. Did Lincoln “usurp” his war powers? How close to the “free zone” did slaves get (excluding escapees and those with owner permission to go there (i.e. temporarily, just passing through))? 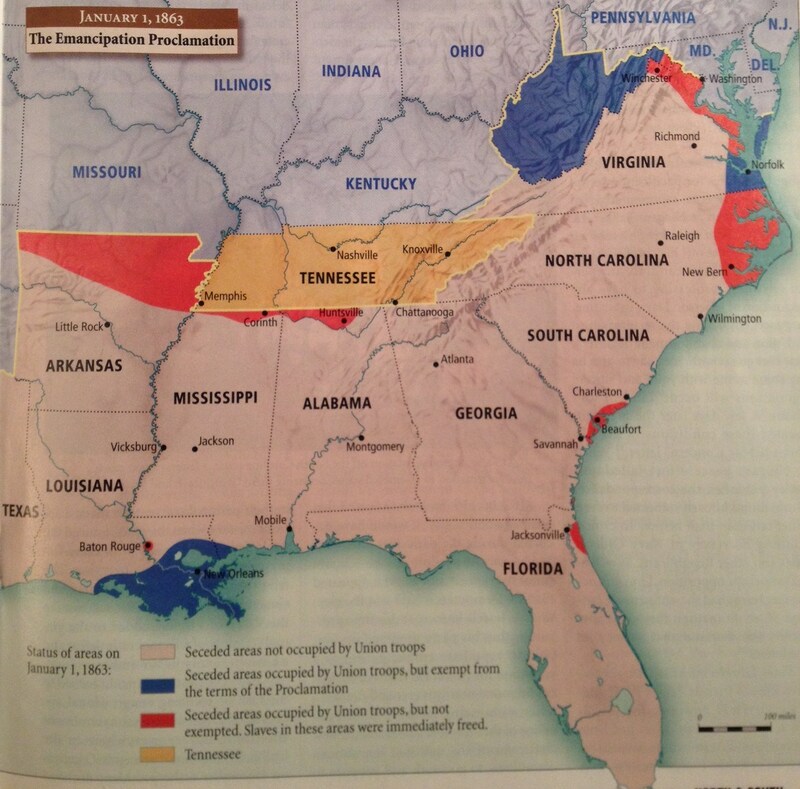 What portion of Northerners were against slavery for humanitarian reasons in 1860 America? Free states and slave states - how did that work? Why did American Abolitionists believe slavery to be immoral? Why did Lincoln wait to issue the Emancipation Proclamation? What was the South actually afraid Lincoln or Congress would do that precipitated the Civil War?